A network is a group of related computers that exchange resources, files and possess some kind of communications within themselves. The communication word in this reference means ‘DATA’. Since these activities are going in between the computers they are called as Computer Networks. Let’s see an example of a Computer Network for overall understanding, this explanation will make readers understand how things work and behind the scene story. Get set GO…….. Within a network, there is a host (many hosts can be there) and within a host, there is a process (many processes can be there). So the process is Mr. Ron wants to open www.google.com (domain name) on his web browser. He has to connect to the Google server to get the web page on his system. See the dotted lines that emerge from A and reaches to B (image description is available). Now with using only the domain name, we have to identify the network, the host and the process which is the entire thing we will see happening. The domain name (i.e. www.google.com) must be converted to IP address so that it can be understood by the receiving host and networks. So using the network ID we can reach the target network and using the Host ID we can reach the Target host. After this, we need Port Number to reach the process. This is how the connection works for web services. 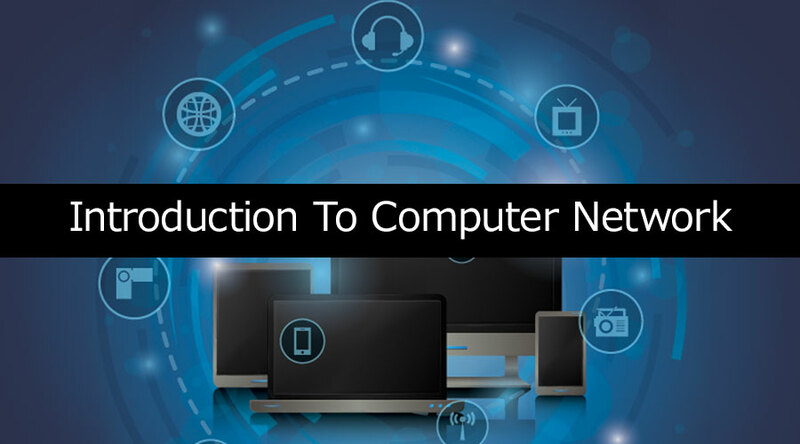 After learning the introduction of a computer network and it’s process now we are going to learn the types of a computer network. This is designed for small areas or work units such as an office, group of buildings etc. These are preferred as they are easy to design and troubleshoot. Personal computers and workstations are generally preferred to have a LAN network. Under the LAN network distributions – we have a ring, bus, star and Tree topography. With LAN there are advantages of resource sharing, data centralization facility, data security, sharing connections. Some disadvantages that LAN networks have are high-cost setup, privacy violation, data security threat, limited area reach. It is easy to understand with the name itself. It can be a private or public network. It has the potential to cover the entire country. After learning the introduction of a computer network now we are going to discuss the ISO/OSI Model. Below is the connection diagram for TCP/IP – Reference model. The 7 connection layers work as depicted below. In OSI (Open System Interconnects) there are 7 layers. The OSI defines the networking framework to implement the protocols. Moving forward to the TCP/IP model is a four-layer reference model. All the protocols that belong to this model are located in the top three layers of this model. There are multiple LAN protocols below the IP layer. We can say that the internet is essentially an IP internet. Currently, the internet uses (mostly, but no longer) IP version 4, which is a 32-bit address size. Since some technical dependencies are there that pressurizes to move to new large blocks. With this, there is an increasing pressure to convert IPV4 to IPV6 with 128-bit address size. Both are universal routing and addressing protocol. IPv4 has 12 header fields whereas IPV6 has only 8. The length of header filed is 20 (for IPv4) and 40 (for IPv6). There are two kinds of number system that are used in a computer network. They are – Unary and Binary, the unary number system has zeros (0) whereas the Binary has zeros and ones (0 and 1). HUB: It is used to connect multiple network hosts and even use for data transfer. A data transfer that takes place either via a wire or wireless is through medium called packets. Whenever the host sends a data packet to any network, the hub copies out the data packet information which is connected to it. But this makes HUB less in terms of security. SWITCH: It also works on LAN, but it proves to be smarter than the hub. Apart from data transmission, a switch is also responsible to filter and forward the details. MODEM: Stands for Modulator-Demodulator; this is helpful in modulating and demodulating the signal between digital data and analog signal. ROUTER: It is a device that helps in routing traffic from one to another network. BRIDGE: It connects two subnetworks being a part of the same network. REPEATER: It is an electronic device primarily designed to amplify the signals.